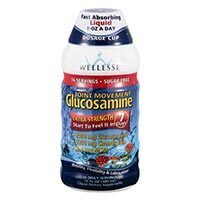 Wellesse Joint Movement Glucosamine combines essential, natural ingredients in a great-tasting berry flavored liquid formula that is easily absorbed by your body. Clinical studies show that Glucosamine and Chondroitin in combination are beneficial in maintaining healthy joint function, cartilage and flexibility. Use only as directed.